L to the O to the U to the I to the E.
one of my lovely cat. 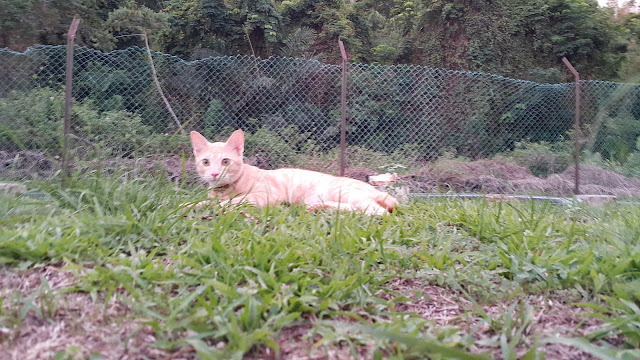 he is the only male cat i have and yet the most manja one. 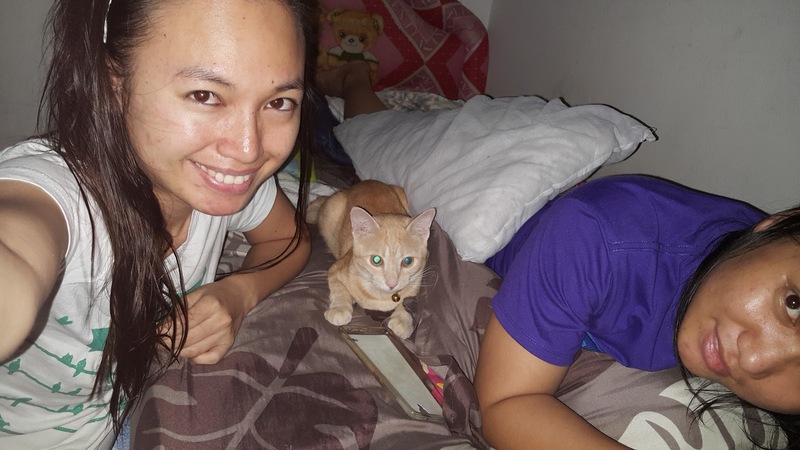 he love sleeping on the bed with us. 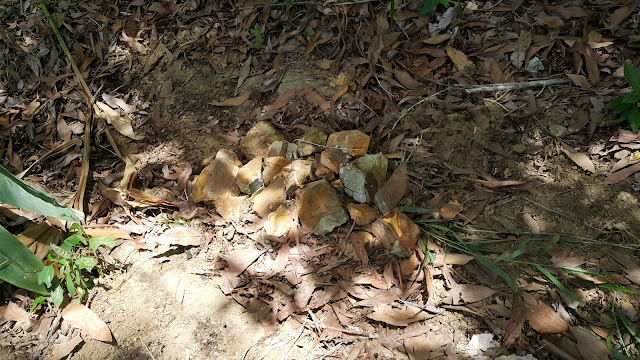 kalau nampak selimut, dia akan cepat-cepat masuk dalam selimut. he is very active and he ate a lot too. memang kalau si Sophie yang makan ayu-ayu tu selalu jadi mangsa rampasan makanan oleh si Louie yang gundoot ni. louie was the smallest kitten among his sibling when Chloe gave birth to him. dan sebenarnya sudah kena book oleh boyfriend adik saya masa beliau kecil lagi. 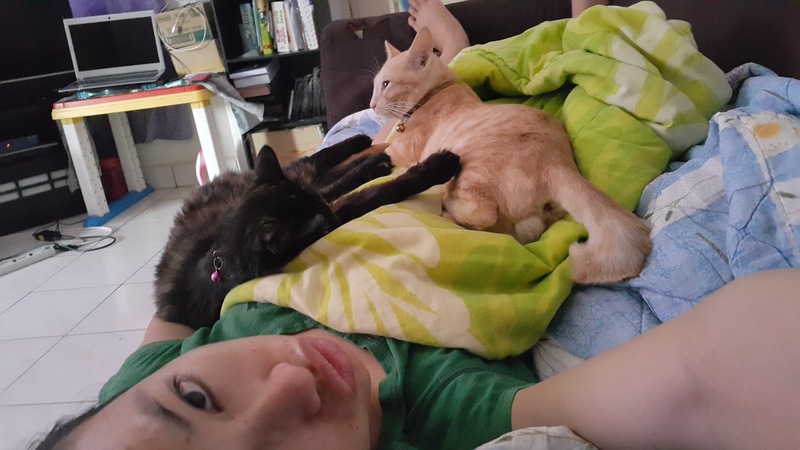 so, i keep 3 of my cats. LOUIE, SOPHIE and WHISKERS. PLAYING IN THE GARDEN is the happiest time for LOUIE. he can't stop running. jakun ba. early in the morning. WE'LL SLEEP ON YOU UNTIL YOU FEED US! "No, You guys are not watching the RUNNING MAN without me!" "i dont understand what is it that you like so much about this JONGKOK guy. i am stornger than him and much more GOODLOOKING than him! 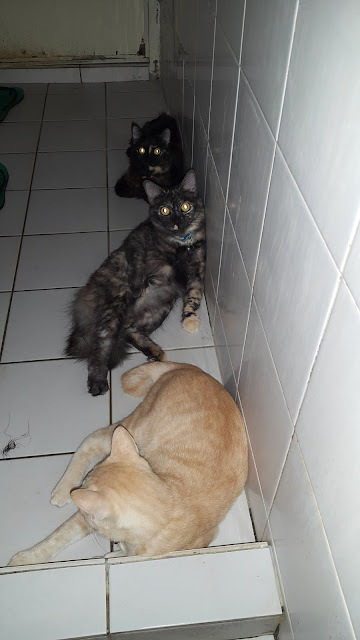 true Story"
"hey guys, let sit here and watch Lilie pooping since she haven't feed us!" FIP is FELINE INFECTIOUS PERITONITIS that attack cat. it causes by the virus called FELINE CORONAVIRUS. it's lika an AIDS for cats. It is not dangerous for human but it very contagious among cats. dia boleh berjangkit melalui faeces dan saliva kucing. and initial infection there will be no sign and symptom so you can't be very sure when you cat are infected by FIP. last may, my ex-housemate brought home a stray cat to home. actually dia mau bawa balik tambunan tapi transit di rumah for 3 weeks. meet BLUE. sangat manja juga ni. so, nama kucing yang dipungut ialah BLUE. i didn't like BLUE at first because i feel like all of my cats hate him too. 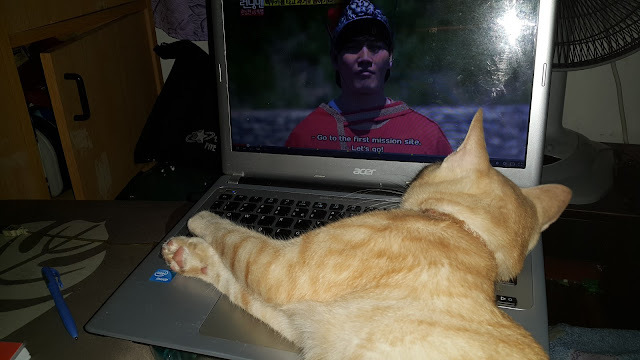 wow.. hebat juga saya ni boleh rasa kucing saya. 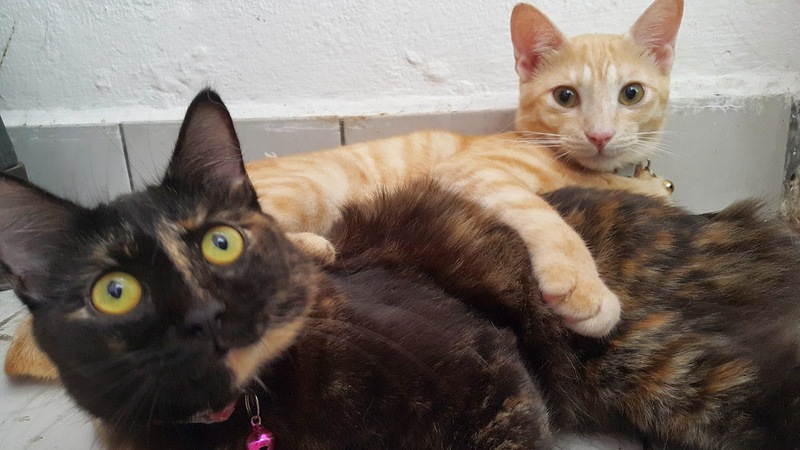 tapi si BLUE ni sangat mesra alam dan sangatlah manja. 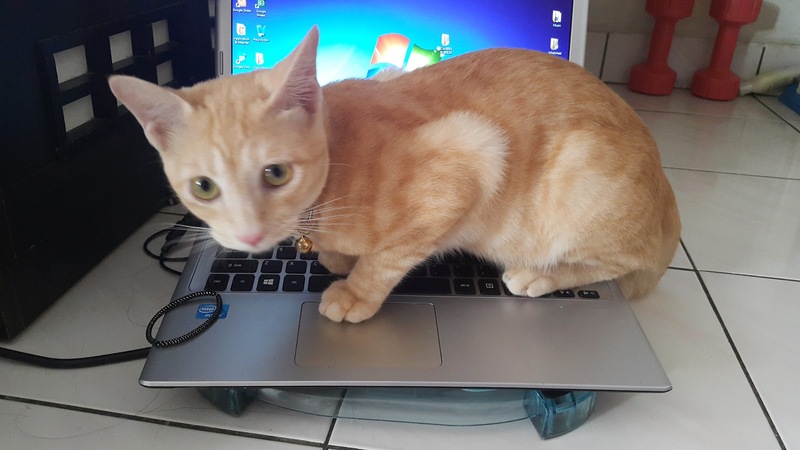 dan mungkin sebab dia jantan, SO, he get used to LOUIE very soon. LOUIE is like a big brother to BLUE. sepanjang tiga minggu dia dirumah, memang dorang berkepit saja. main pun sama-sama. dan memang saya notice sudah during that time si BLUE ada diarhea. my ex-housemate inform me that BLUE died in kampung last month (june) for unknown reason(diurang tidak tau sebab apa Blue mati sebab dorang tidak hantar dia p klinik). so that's when i know that Louie got this disease from BLUE. i noticed Louie started having Diarrhea end of JUNE. then after 3 days masih juga dia cirit birit,that's when i started to get worry. 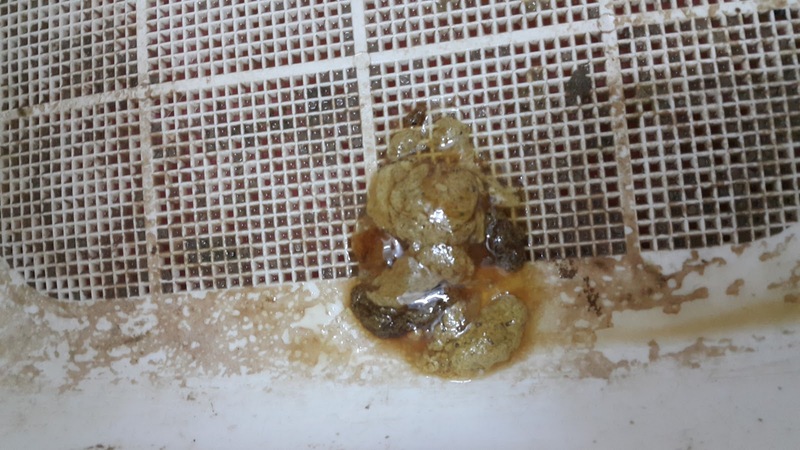 LOUIE'S FAECES after 3 days. 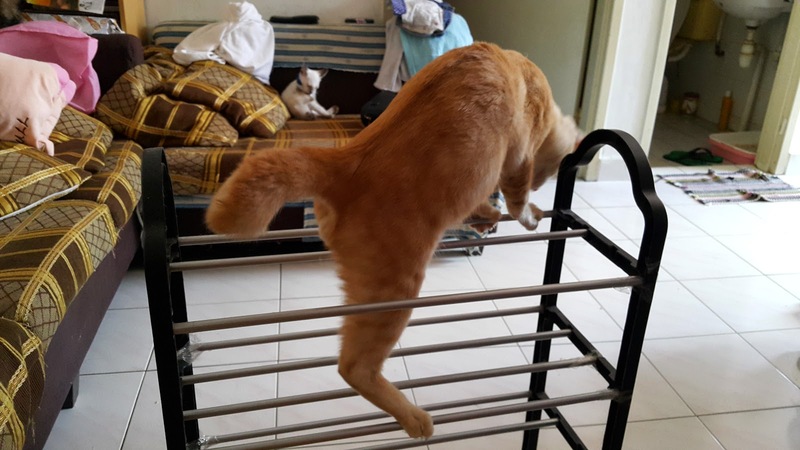 so, i send him to vet clinic and the doctor said its normal for a cat. so, the doctor gave me antibiotic and some charcoal. 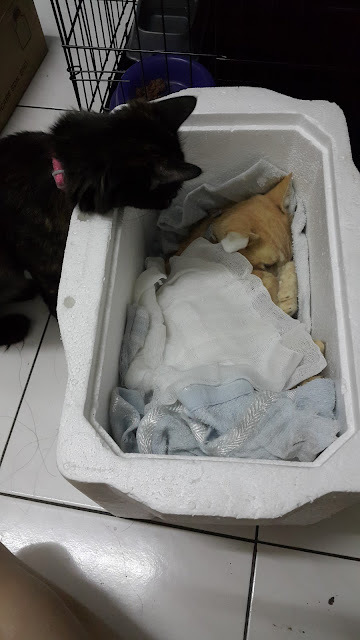 "try bagi dia ubat ini 1 minggu"
but then after a week, LOUIE's condition getting worst. he can't eat. he's having a hard time swallowing his food. he's getting thinner and weaker each day. he's not as active as before. so, i sent him back to clinic after he finish the medication for a week. the doctor said LOUIE was dehydrated, so they transfuse him Dextrose Saline. that night Louie become active again but only temporary. 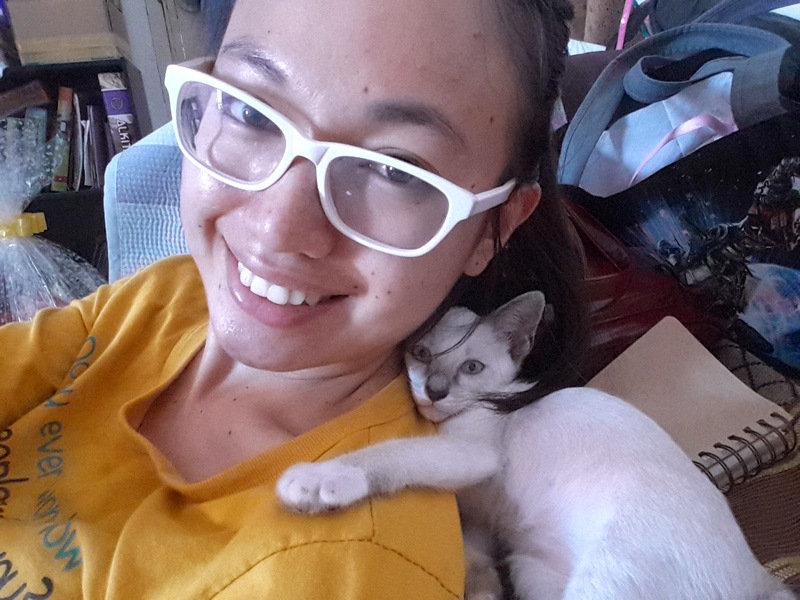 so the next day i send him back to Clinic only to find out that he's infected with FIP. my heart breaks when the doctor told me that there is no cure for the disease. i can't hold my tears. the doctor told me to cage him because he cannot get in contact with other cat or they'll get infected too. so i bought bigger cage STAT for Louie so that he'll be more comfortable. i cried everytime i saw Louie in the cage. i hate doing this my own cat. but i have to or else my other cat will be infected. at this point he won't eat anything. my friend who works in the clinic told me that if he eat there might be 1% chances of survival. "let Louie be that 1% and not the 99%. amen"
i bought everything i could like IMMUNE ACTIVE for him, pro-kolin, some cat's milk for energy. overall it has cost me around RM400 just for his medication. 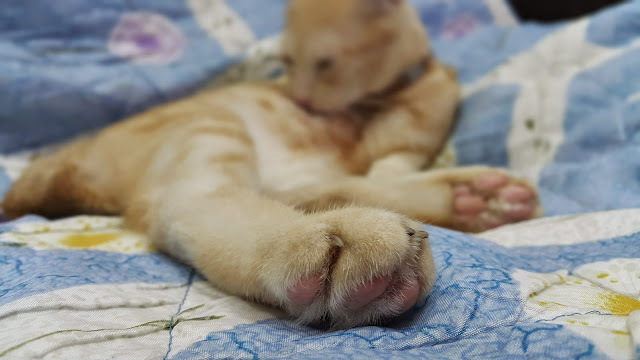 i even cut his nails so that i can feed him easier. the most heartbreaking moment while he's still alive is that, everytime i let him out of the cage for a while, he'll rush to the bed. since he like sleeping on the bed at night with us. and i have to stop him for the sake of SOPHIE & WHISKES. i sleep in the parlor next to Louie cage since i cage him. 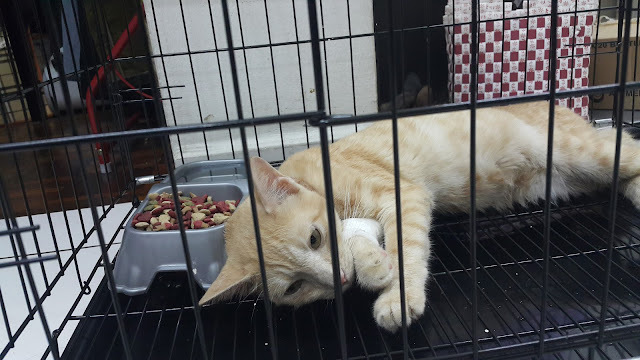 adik saya bilang "ihhh, overrrr"
tapi saya kesian nampak si louie tingu-tingu tu katil di bilik dari cage dia. 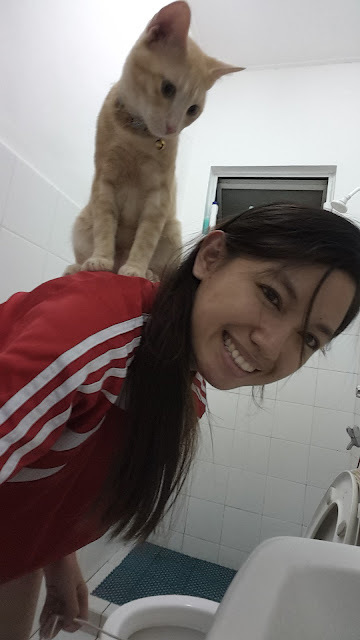 at night he want to get out, i am guessing he want to go to toilet since he used to litter in the toilet. i cut my gym time since then also. usually i'll be at gym at 5.30pm to 8.00pm but then after that i have to get back to home before 7pm to feed Louie, clean his Cage/litter and make sure he get his medication. 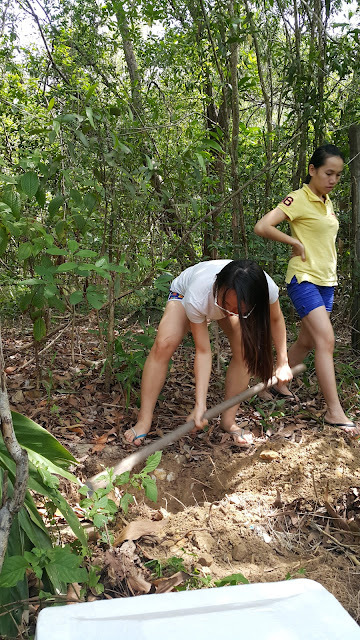 unless if my cousin work morning shift i don't have to worry so much since she can help me with his litter. but 5 days of struggling, he still gone. i feel relieve that we are actually stay by his side until his last breath. 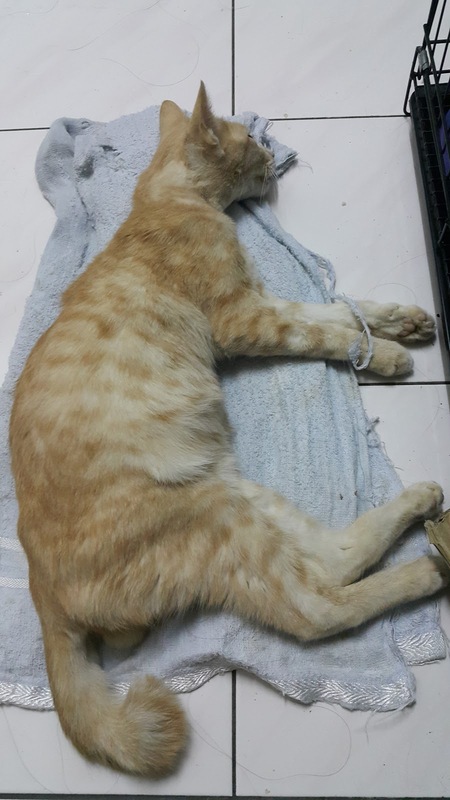 i want to still save him from the very last moment but my cousin said just let him go. the last moment Louie with us. he died shortly after i took this photo. this is his favorite polisterine box. 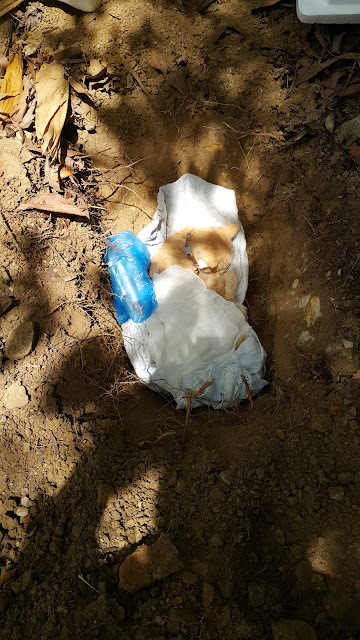 we buried Louie somewhere far from any cat( i hope) because we dont want any cat to get infected by his liquid. goodbye dear LOUIE. you will be miss. 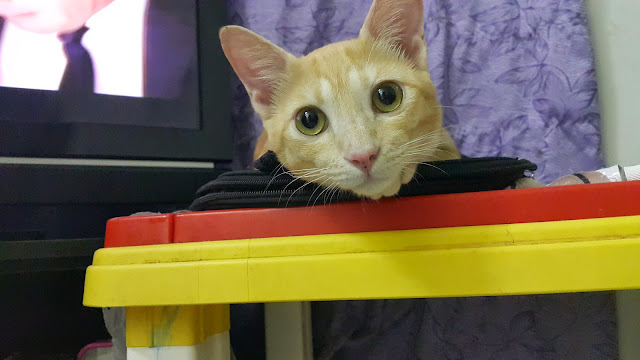 I miss Louie everytime i use my laptop. and i miss him a lot when i am in the bathroom. 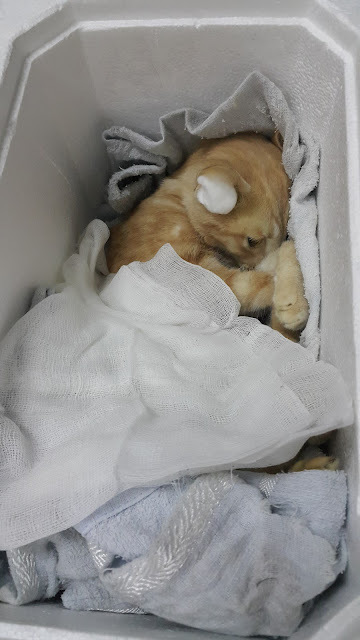 i am a bit disappointed with the Veterinary's management (i am not going to mention the clinic's name) since i went to the clinic 2 times and they should have detected LOUIE's disease the second time i was there. but they only do the viral test on my third visit and by that time my Louie was very very weak already. 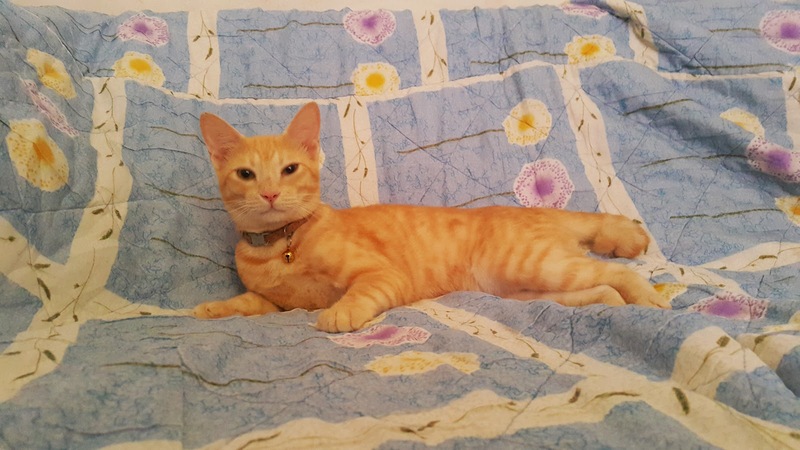 now my other cats is at risk of getting FIP too, since they are in contact with LOUIE 2 weeks before i cage him. i am sharing this so that all of us (cat's Lover/owner) take precautions for our cats. 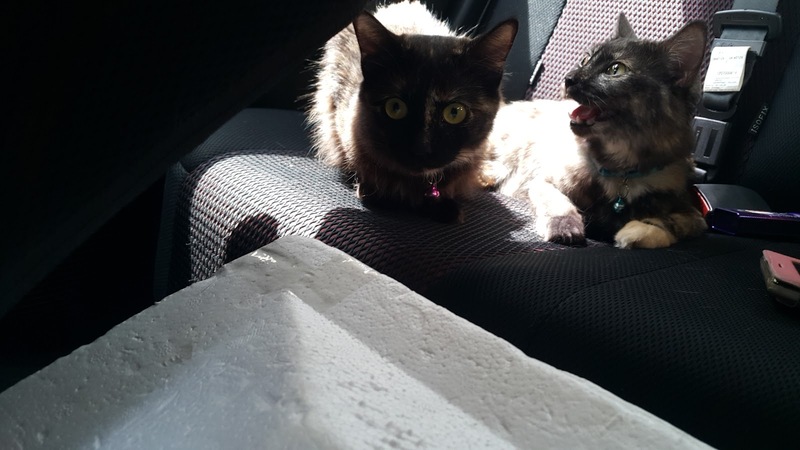 always do the FIP test before bringing other cat's into our home. always and always expect the worst. it's okay to be paranoid and pay more then to have a deadly cat at home. ask the doctor to perform FIP test if you think its not a normal disease. always always appreciate you pet. they are not always there. Sometimes when you surrender, you make peace.